Image Size: 30.5" x 26"
Paper Size: 30.5" x 26"
Founded in 1943 by Lockheed's legendary aircraft designer, Kelly Johnson, the "Skunk Works" Advanced Development Company has produced many of this nation's greatest airplanes. From the P-80 Shooting Star, first U.S. operational jet fighter, to the exotic Mach-3 SR-71 Blackbird, and from the U-2 spyplane of the 1950's to the sly F-117 Stealth Fighter that dominated the skies during Desert Storm, the "Skunk Works" has certainly validated the slogan, "Look to Lockheed for Leadership". 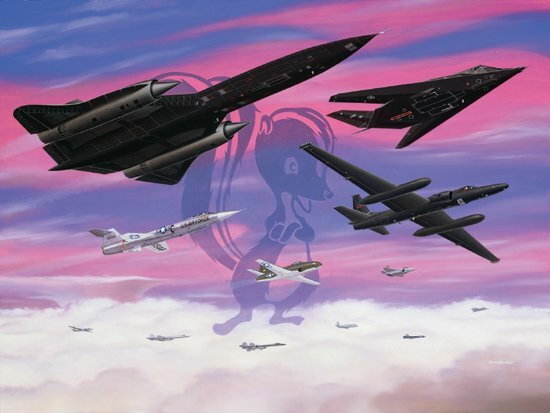 This print was commissioned by Lockheed Advanced Development Projects Division and commemorates the "Skunk Works" 50th Anniversary in July, 1993. Personally autographed by Tony Levier, Robert J. Gilliland, William C. Park, Harold C. Farley, Dave Ferguson, Ben R. Rich and Sherman N. Mullin.